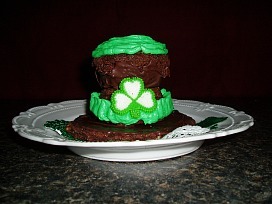 I did not learn how to make St Patricks Day desserts when I was young. They were not a even a thought back in the early days in Ireland. Prior to the 1600s the average people of Ireland, the peasants were happy just to have enough food to sustain them. The hearty crops of potatoes were a welcome sight for the people; they became healthy eating only potatoes and a little milk. The Irish appetizer recipes made from potatoes are some of my favorite. In reading about the Irish food history, I have read several references to an old time dessert called “goody”; this is something which was made for parties. I have not been able to find any original recipes for this; the recipes that I have found contain ingredients which I am sure were not available at that time. Ireland had milk, butter and eggs so I am thinking “goody” is like a pudding which they cooked over the fire. They did raise oats and had honey so I am sure it was sweetened with honey; probably some oats were added and they helped to thicken the pudding. You can see why this would be considered a party dish back then considering that normally they were use to eating very little bland food to live. Sugar beets became an important crop for Ireland in the mid to late 1800s. With the creation of a sugar producing factory, sugar became more available and affordable. This is probably when the cooks learned how to make some of our St Patricks Day desserts, similar to what we have today. Ireland went through many turbulent years with the sugar industry; now all of their sugar factories have been closed. I have noticed that the desserts in much of Europe do not seem as sweet as what we make here in the United States. I believe much of this is attributed to the higher cost of sugar. When the availability of a product is limited, as in result of closing all of Ireland’s sugar factories, the product becomes more expensive to buy. People learned how to make St Patricks Day desserts for celebration parties more when the Irish people immigrated to this country. They combined their great recipes with the many new ingredients found here when they arrived. We now have some fabulous Irish recipes; I classify them into three categories now. The first are the recipes brought here from Ireland, the second group are the recipes developed here (especially in New York) by the Irish, and the last group are the “green recipes” or the ones colored green, like many of the Irish cookie recipes, to celebrate St Patrick’s Day which we all create and make. These Irish cupcakes made from my chocolate cupcake recipe and a chocolate cookie recipe are my version of the St Patricks Day desserts (“green recipes”) made for parties. 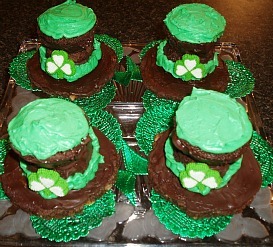 This recipe makes 24 cupcakes; it takes 2 cupcakes and one of the cookies (recipe below) for each leprechaun hat. You will also need melted semi sweet chocolate and frosting (recipe below). Grease regular size cupcake tins, cut wax paper to line bottom, grease again and flour tins. Combine and sift flour and sugar. Mix in saucepan butter, cocoa, oil and water; bring to a boil and pour into dry ingredients and stir well. Add buttermilk, eggs, baking soda and vanilla; mix well and spoon into prepared tins. Bake about 12 minutes or until pick comes out clean; cool 15 minutes, and remove from pan. This chocolate sugar cookie recipe makes 12 cookies to use as the brim of the leprechaun hats. The cookies and cupcakes shape the hats for my St Patricks Day desserts. Melt chocolate and butter in saucepan over low heat; stir until chocolate is melted. Remove chocolate from heat and stir 1 cup sugar into melted chocolate; stir in beaten egg and vanilla. Combine flour, baking soda and salt in bowl; blend in chocolate mixture. Shape dough into 12 balls; dip balls in additional sugar and place on ungreased cookie sheets. Flatten cookies with bottom of glass. NOTE: Cookies will spread so place far apart on cookie sheets; after baking they should be 4 inches across. Bake about 10 minutes or until set; cool a few minutes before removing to cool completely. This frosting makes these St Patricks Day desserts perfect; it is luscious and so Irish in green. Combine butter and cream cheese; beat until light. Blend in Crème De Menthe; gradually beat in powdered sugar and enough cream to make spreading consistency. Blend in green food coloring (I use Wilton’s paste for a good green color). NOTE: I place cookies and cupcakes in freezer for short while; they hold together better and chocolate sets up faster. Spread melted chocolate over cold cookie. Coat sides of 1 cupcake with melted chocolate; place top side down on top of cookie. Spread a little melted chocolate on the bottom side up of cupcake. Take another cupcake and coat sides with melted chocolate; place bottom side down on top of first cupcake. When chocolate is hardened top hat with green fluffy Crème de Menthe frosting. With green frosting make a band around hat and stick a candy shamrock to band with frosting. I am serving with a scoop of ice cream. Barley recipes became very important to the Irish culture; even developing many traditional Irish desserts for use as St Patricks Day desserts. Barley is an important crop in Ireland; it is used as grain to feed the animals and the straw from the barley is used as animal bedding. Barley is very important to the beer and whiskey industries and of course the endless barley recipes now prepared in the kitchens. The following is one I made for St. Patrick’s Day. BARLEY MUST BE SOAKED OVERNIGHT. I tried to rush it and soak for only five hours and it does not get soft enough. Drain barley and add cream, sugar, salt and green food coloring. Stir in 2 tablespoons Irish cream and 1 teaspoon vanilla; cool to room temperature. Whip cream gradually adding in 1 tablespoon Irish cream, 1 teaspoon vanilla, powdered sugar and green food coloring. Beat mixture until stiff and fold into cooled barley mixture; Sprinkle top with green sugar crystals. I have added this Irish eggnog punch recipe to the St Patricks Day desserts. It is much more than just a punch to drink; it is a dessert. The combination of coffee, spices and Irish whiskey makes it unforgettable. Combine eggnog, brown sugar, coffee, cinnamon and nutmeg in a mixing bowl. Beat on low until sugar is dissolved; chill 15 minutes. Stir until coffee is dissolved and stir in whiskey; chill for at least 1 hour. Pour into crystal glasses leaving room for ice cream balls; garnish with whipped cream. Add this coffee pie recipe to your St Patricks Day desserts; a great way to serve coffee and cream. Here again you have a combination of coffee and Irish whiskey but this time the addition of heavy cream and in a chocolate crust. How delicious! Sprinkle gelatin over cold milk; soften for several minutes. Beat egg yolks in heavy saucepan with wire whisk; whisk ½ Cup of the sugar. Dissolve coffee in hot milk; gradually stir hot milk mixture into yolk mixture. Cook over medium low heat stirring constantly until mixture has thickened enough to coat a spoon. Remove mixture from heat; add softened gelatin and stir until dissolved. Cool mixture slightly and stir in whiskey; refrigerate until custard is thick when dropped from spoon. Beat egg whites in another bowl until frothy; gradually beat in remaining sugar. Continue beating egg whites until stiff peaks form. In another bowl beat whipping cream until stiff peaks form. Fold custard into beaten egg whites; then fold in whipped cream. Turn mixture into cooled pie crust; refrigerate for 3 to 4 hours and garnish with grated chocolate. Many countries have trifle desserts; this is also true for Ireland. Green pudding desserts make great St Patricks Day desserts like this pistachio fruit trifle with Irish whiskey. Cut sponge cake into cubes; soak with Irish whiskey. Place a layer sponge cake using ½ on bottom; top with pears. Spread ½ of pistachio pudding over pears; sprinkle with sliced pistachios. Layer another ½ of cake cubes; Top with 1 can drained mandarin oranges. Top oranges with 2 cups whipped cream; top whipped cream with ½ pistachio pudding. Top with other can drained mandarin oranges; then layer fresh blackberries. Top with whipped cream; top whipped cream with pistachios and fruit to garnish.